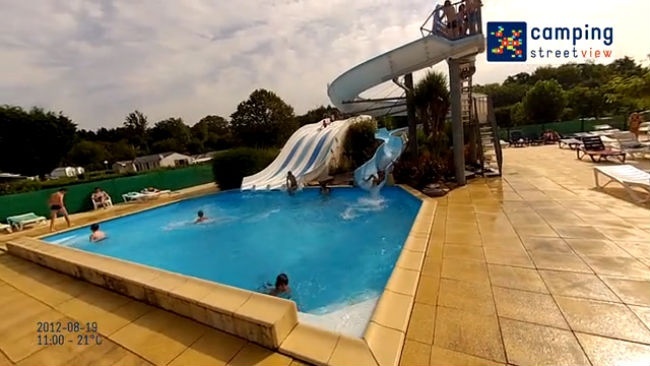 close at hand from THE BAY OF MORBIHAN, The PENBOCH Camping is situated in an outstanding natural site in Southern Brittany, in the very heart of a historical and tourist region; 200 metres from the Bay of Morbihan; 5 kilometres from Vannes, in a green and calm setting. Besides the quality of our sites, set in a landscape which has been designed to give most calm to residents and a fast access to facilities which we give to our guests’ disposal: in tents, caravans, or which have chosen the comfort of our rentings in mobil-homes or cottages. mobil home 4 people, 2 bedrooms,: 1 bedroom with a large bed, 1 bedroom with 2 single bed. bathroom with shower, wash basin, a separate toilet. living room with TV set (french channel only) a kitchen with fridge, cooker and microwave and coffee maker. 4 electric heating. Half covered Terrace with garden set and 2 sunloungers. Gîte classé Gîte de France 3 épis, situé dans un ensemble de bâtiments avec 5 autres gîtes. Au rez de chaussée, séjour avec coin cuisine, wc, salle de bains,chambre, à l'étage 2 chambres, salle d'eau, wc. Terrasse privative, terrain commun. Golfe du Morbihan à proximité. Gîte classé Gîte de France 3 épis, situé dans un ensemble de bâtiments avec 5 autres gîtes. Au rez de chaussée, séjour avec coin cuisine, wc, à l'étage 2 chambres, wc, salle d'eau. Terrasse privative, terrain commun. Golfe du Morbihan à proximité. Places separated with electricity 10 amps. The camping aslo has a 'Great Comfort' site with current water supply and used water evacuation , possibility of renting hire of fridge compartment main building. Gîte classé Gîte de France 3 épis, situé dans un ensemble de bâtiments avec 5 autres gîtes. Au rez de chaussée, séjour avec coin cuisine, wc, à l'étage 3 chambres dont 1 avec salle d'eau contigu, wc,, salle de bains. Terrasse privative, terrain commun. Golfe du Morbihan à proximité. Gîte classé Gîte de France 3 épis, situé dans un ensemble de bâtiments avec 5 autres gîtes. Au rez de chaussée, séjour avec coin cuisine, wc, à l'étage 3 chambres, salle bains, WC. Terrasse privative, terrain commun. Golfe du Morbihan à proximité. NEW - Mobil home 6 people - 3 bedrooms - 1 bedroom with a large bed, 2 bedroom with 2 single bed, posibility to instal a baby cot- bathroom - separate toilet- A kitchen with fridge, cooker and microwave and coffee maker. 4 electric heatingTV set (french channels) - Covered Terrace with garden set and 2 sunloungers. Gîte classé Gîte de France 3 épis, situé dans un ensemble de bâtiments avec 5 autres gîtes. Au rez de chaussée, séjour avec coin cuisine, wc, salle d'eau avec douche, à l'étage 3 chambres , wc,, salle de bains. Terrasse privative, terrain commun. Golfe du Morbihan à proximité. Gîte classé Gîte de France 3 épis, situé dans un ensemble de bâtiments avec 5 autres gîtes . Au rez de chaussée, séjour avec coin cuisine, wc, , à l'étage 3 chambres , wc,, salle d'eau avec douche. Terrasse privative, terrain commun. Golfe du Morbihan à proximité. NEW - Mobil home 8 people - 4 bedrooms - 2 bedroom with a large bed, 2 bedroom with 2 single bed, posibility to instal a baby cot- bathroom - separate toilet- A kitchen with fridge, cooker and microwave and coffee maker. 4 electric heatingTV set (french channels) - Terrace with garden set and 2 sunloungers. Really clean, modern, well presented with a great area around it. Brilliant campsite for exploring or relaxing in a beautiful area. Cleanliness of toilets with no soap provided and the prices of drinks, ice creams and chips was excessive. Pool opening at 10 is too late and closing at 7pm is too early! The location, facilities and accommodation are all outstanding. Family run by the same family for at least the last 20yrs we have been going. The pool area was lovely but there was very little shade, some more parasols would have been welcomed as we struggled to keep our baby out of the sun. One last niggle that surprised us, no kettle!? The area in general was lovely and we'd like to go back., the local town was lovely...great bread shops and butchers. The pool was a highlight and much needed in the heat that we had during our stay, very clean and tidy. Being so close to the beach was great too. The staff were all very friendly and helpful and we had a lovely holiday. The caravan/mobilehome had wooden decking which was in poor condition which resulted in us getting a few nasty splinters and the ceiling in the lounge area looked horrid. I personally would have liked more space between the caravans, our outlook was just that of the next caravan along which was a bit disappointing. It had a nice layout and we liked having the decking with the shaded area and the wide opening doors, a great design feature. Good location for visiting the local area, SuperU near. A minor point... I wish that the shop had a facility to re-freeze cool bricks. Instead of that, you have to buy bottles of frozen water each day. This is not environmentally friendly, it contributes to plastic waste. Very level. Shady tree. Hedge. Bar area not very appealing. Fantastic location, great pitch. Quiet the week we stayed. Enjoyed the indoor and outdoor pools and playing ping pong. Great that you can order bread from reception. Staff very nice and spoke good English.